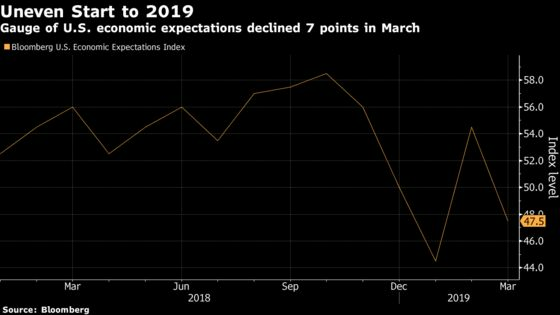 (Bloomberg) -- U.S. consumer expectations for the economy dimmed for a fourth time in five months, signaling an uneven start to the year even as a weekly comfort measure remained elevated. The Bloomberg Consumer Comfort’s monthly gauge of economic expectations fell to 47.5 from 54.5 as more respondents said the economy is getting worse, the survey released Thursday showed. Meanwhile, the weekly comfort measure edged up and remains near a recent 18-year high. The mixed results follow Labor Department figures showing U.S. hiring weakened in February. They point to a potential warning light on the economy even as sentiment gauges generally remain elevated amid rising wages, a stock-market rebound and low interest rates. The University of Michigan’s preliminary March survey of consumer sentiment last week showed better-than-expected improvement while the Conference Board’s measure rose in February as present conditions advanced to an 18-year high. Federal Reserve Chairman Jerome Powell said at a press conference Wednesday that confidence surveys for households and businesses are at attractive levels while underlying economic fundamentals remain strong. Even so, the monthly comfort survey showed 32 percent of Americans saw the economy getting worse, compared with 28 percent who said it was improving. It was the second time in three months that more respondents pointed to worsening conditions, something that before this year hadn’t happened since the end of 2017. The weekly survey showed improvement across all three main components: the state of the economy, personal finances and the buying climate. The finance gauge matched the 18-year high of 67.9 that it reached two weeks ago. The gauge for respondents with incomes under $15,000 rose to a record in data going back to 1990, while measures for the unemployed and those ages 18-34 were the highest since 2000.